I dove in and made my first batch of pesto of the year. Then, I remembered that pesto is super easy to make, and not intimidating at all anymore! Anyone can do it! And the flavor is so worth it, no matter what you put in! Plus, did you catch that you can make pesto out of more than just basil? With a list as broad as that, pesto becomes a great way to use up lingering greens from your CSA or your garden. Oh yeah, pesto freezes well, too! Greens and/or herbs: Basil is traditional, but you can make pesto out of any type of green/herb or a mixture! My most recent batch was turnip greens, basil, and carrot tops. It was delicious! Cheese: Parmesan is traditional, but as long as it’s a hard cheese it's flexible. Asiago, pecorino, and romano are all good choices as well. Use what you’ve got in the fridge, or try something new. Nuts: Pine nuts are traditional, but sunflower seeds, walnuts, pecans, almonds, etc. work, too. Optional, toast them in a dry skillet before making your pesto to enhance their flavor. Garlic: Any kind of garlic works: fresh uncured garlic, garlic scapes, garlic chives, or regular garlic cloves from a cured, dried bulb. Oil: Olive oil is traditional, but use whatever you have! Salt: Any kind is fine. Optional Acid: Fresh lemon juice, vinegar, or lemon zest. Toss all of the above ingredients into your blender/food processor and blend. Or stream the oil into the pesto slowly until you reach the desired consistency. Taste the mixture, and add additional garlic, salt, parmesan, etc. to taste. Voila! Pesto! Refrigerator method: Pesto will keep in the refrigerator, stored in a glass jar and covered with a thin layer of olive oil, for several weeks. Freezer method: Freeze in an ice cube tray, then store the frozen cubes in a bag in the freezer to pull out and add pesto flavor whenever you need it. It should keep frozen that way for a winter’s worth of delicious flavor. The other thing I assumed about pesto growing up was that it always only went with pasta. Ha, the things you learn being a farmer! While it is true that the most traditional use of pesto is as a sauce for pasta, it can be used in so many other great ways! I made this awesome list to help you (and me!) find creative ways to make the best out of your pesto! Mix pesto into hummus, sour cream, Greek yogurt or guacamole for a pesto flavored dip for veggies or crackers! Thin your pesto with a little more oil and some vinegar to use on a salad. Add a some greek yogurt to make it a pesto ranch dressing. 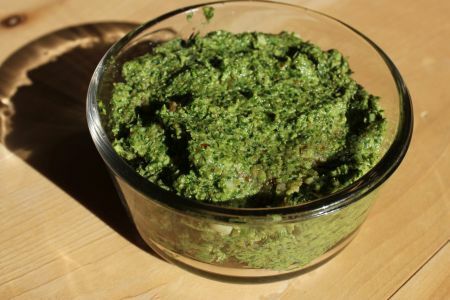 Add a little chicken broth to your pesto to make a sauce for meat or roast chicken. This can be a great way to remake leftover protein. Make a spread for a sandwich, flatbread, burger or wrap. Mix pesto into some mayo, cream cheese or mashed avocado to dress up your usual fare. Use approximately ¾ cup pesto to 4-6 tablespoons softened butter. Mix together and you’re ready to serve with your French or garlic bread at dinner! Instead of oil or butter, use some pesto! Add it to a baked potato or to your roasted veggie medley! Or try the Maple-Roasted Carrots With Pesto recipe below. Mix it into your zucchini noodles. Kinda like pasta but veggie based using a spiralizer! This would be delicious with some fresh tomatoes and parmesan cheese added. Add it to a soup. A traditional ingredient in Minestrone soup is pesto. It goes very well with any bean soup or in a pesto tomato soup! Add it at the end as a garnish. Use pesto instead of or in addition to tomato sauce on your pizza. Spread a thin layer on your dough and then top with your regular toppings. Fresh tomatoes would go great on a pesto pizza. Add it to grilled or roasted meats. Whisk with some additional oil, brush onto grilled meats like steak, salmon or chicken. Or rub it on a roast chicken. Yum! Add it to cold summer salads. Making chicken salad? Add pesto! Making your pasta salad? Add pesto! White bean salad? Add pesto! Making potato salad? Add pesto! Top your eggs for breakfast. Drizzle some pesto over your scrambled eggs, or top a quiche or frittata. What is your favorite thing to do with pesto? Let me know in the comments below!